SewHappy Crafts is a home based business. 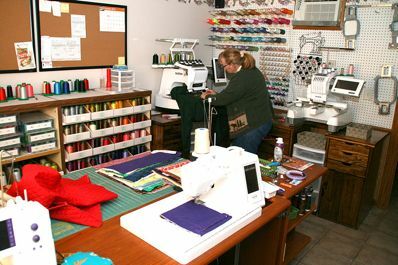 It evolved into a business from Denise's love of creating things with her hands. Denise has been doing crafts her whole life. Her mother taught her to knit & crochet at a very young age. She knit her first sweater at age 10. She learned to sew with a machine, do embroidery and other skills on her own. 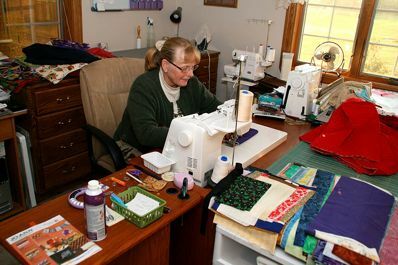 She perfected her sewing skills through the years & has branched out to also do machine embroidery. Doing all the sewing and crafty things, projects started piling up around the house. Needing an outlet for all of these items, Denise entered the Craft Show circuit in 1991 and the business was born. She has won several ribbons and prizes for her quality work at these shows. Her husband Jack also helps Denise with the transporting, set-up and tear-down at the craft shows. He also has taken over some of the household duties allowing Denise more time to create and attend to the business of doing business. Denise working hard to make more sweatshirts! Sewing up more potato bags!